Blackwork Embroidery – Online Class Give-Away! Good news for those wishing to learn the ins and outs of shaded blackwork! 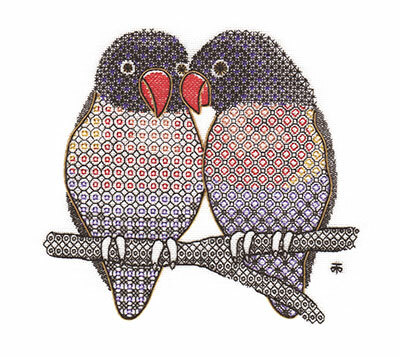 Tanja Berlin is running an online embroidery class for her Blackwork Love Birds. Registration is open now and ends on September 2. The class runs September 12 – November 21st. There are so many great advantages to taking online embroidery classes! For one, you have access to a qualified teacher who will help you, one-on-one, through tricky spots. Even at face-to-face classes at seminars and the like, you rarely have the undivided attention of the instructor for any extended period of time. When you’re working online with an instructor, you have access to the instructor via email (or a class forum) for any and all of the little difficulties that you might run into with a given technique. You receive feedback when you need it – either the “yes, you’re doing that right” you need to encourage you to go forward, or the constructive criticism and helpful tips to make you a better stitcher. Another reason: online classes are affordable. In an online setting, you get to work the same level of projects that were only available in seminar or workshop settings, before the advent of online classes. You can still go to seminars and workshops today – and they’re a lot of fun! – but in addition to daily class fees and kit fees, you also have to pay for for travel, food, and lodging for the number of days you’ll be at the workshop. Online classes eliminate the bulk of the expense required to attend seminars and workshops – the travel and lodging. But perhaps the greatest advantage of an online class is the flexibility that an online affords the person who otherwise could never take the time to travel to a seminar and devote two, three, or five days solely to needlework. With an online class, you work at your own pace. If you can’t spend time stitching on this day or that, well – you don’t have to! If your family reunion is scheduled for the end of the month, no big deal! You can go, and you can still participate in your online class. If you work full time and you have no vacation time left, not to worry! You can stitch around your work hours, conveniently adapting the online class to your own schedule. So, lots of advantages! And while I agree that there’s nothing more fun than hobnobbing with enthusiastic stitchers face-to-face at a workshop or seminary, many of us can’t afford to go to seminars, either because we can’t afford the time off or the extra travel expenses. So the online class is a great substitute – it’s flexible, it’s affordable, it gives you access to quality instructors, and you can communicate with fellow stitching enthusiasts via the online classroom setting. There. That’s my plug for online classes! Now, why the Blackwork Love Birds class in particular? It’s perfect for beginners and beyond. If you have any interest in learning blackwork – and especially in learning how to shade effectively in blackwork techniques – this class is a great way to learn! Tanja’s instructions are absolutely at the top of the industry when it comes to detailed, step-by-step instructions written for beginners (and beyond). They are clear, easy to follow, and easy to learn from. As a graduate of the RSN and a long-time world-traveling teacher, she knows how to teach. 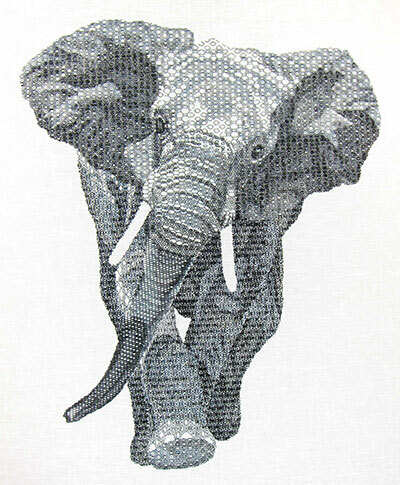 And finally, if you’ve kept up with Tanja’s latest blackwork pursuits, you might know that she’s recently designed this gorgeous blackwork elephant, which she’s teaching at the Embroiderers Association of Canada National Seminar in Calgary in 2015. If you have an interest in taking that class or working the elephant or something similar down the road, the Love Birds makes a perfect prelude for learning the basics of blackwork shading. Today, courtesy of Berlin Embroidery Designs, I’m giving away a Blackwork Love Birds class – the full materials kit, 12 inch stretcher bars and thumbtacks, all the instructions, and classroom access ($120 total value). The Give-Away is now closed. Thanks for participating! 1. Leave a comment below – just follow this link straight to the comment form. Comments sent in via email or left on any other article on Needle ‘n Thread are not eligible. What aspect of an online embroidery class attracts you the most? 3. Please make sure you leave recognizable name either in the comment box or in the “name” line on the comment form. 4. Leave your comment before 5:00 am CDT (Kansas, USA), Friday, August 15. I’ll announce the winner that day. The give-away is open to anyone, anywhere, so feel free to join in today! You can find all the information about the Blackwork Love Birds class right here on Tanja’s website, if you’d like further details. September 16, 2013 Needlepainting Class Winner Announced! I love the idea of being able to revisit parts of the class that I didn’t fully grasp the first time! what i love the most is the flexibility of being able to work at your own pace and at the same time feel like you have your own personal instructor at your side. I love Berlin Embroidery kits i am finishing jacobean tree with bird her service is excellent and i thank you for making this offer. An on-line embroidery class would work well for me. I am a night owl for one! and wouldn’t be embarrassed by do overs! and being slow! Thanks for the opportunity. It will be the flexibility. With two kids, part-time working, kids after school activities, time for embroidery during the day is rare. I would love to win this. It would be a great new experience. I just love Trish’s design. I would absolutely love to win this kit! I’ve always wanted to do blackwork but have never found the courage to attempt it. Thanks so very much for making this available to someone. I just hope it’ll be me! I love that I can learn at very odd hours in my jammies! As for the blackwork, I started one long, long ago and would love to get back to it…seeing the gorgeous shading has me hooked in again! Thank you for the chance to win. The most attractive aspect of online classes for me is the lack of travel, closely followed by having all my tools etc. right at hand. I’ve taken online classes in the past and Love them. Thanks for the chance to participate in Tanja Berlins Blackwork class. I appreciate on-line classes for all of the reasons you listed but also I am rather house-bound so an on-line class is great for me. I love the look of the birds. Hello Mary, what a wonderful Give-Away! and perfect timing for me if I won. I have experimented with blackwork stitches on a sampler and am ready to try a picture next. This on-line class would enable me to do just that, with the help of a RSN tutor but without the travel and accommodation I would need if I were to attend a RSN teaching centre – perfect. Fingers crossed. I love the idea of the online class. I’ve found myself using the same stitches for years and want to get into new and different techniques. Having instruction would be amazing, get over that questioning of “did I get it correct?”. thank you for providing these opportunities. I’ve done blackwork, but nothing like this. Her pieces are breathtaking I would love a chance to take one of her classes. Online classes attract me as I live in a small town with limited resources, we don’t even have a craft store. It sounds like online classes are a great way to keep embroidery alive and well. What a great and convenient way to learn and practice new skills. Oh My Gosh! That elephant is gorgeous! I actually bought the materials to do the blackwork sampler that you blogged about earlier this year, but I have been so busy making birthday, Christmas and wedding gifts, that I haven’t been able to stitch for myself. My wedding gifts will be done by September 2 and then I will finally have time to stitch for me! I want to do this class! It looks like just the right amount of complexity for me and I do like Blackwork with a smiddgeon of color. Thank you for advertising this opportunity! Online embroidery appeals to me because of my busy schedule. I can take my time, review the stitches and pattern at home, while I learn from an expert online. Since finding Mary’s Needle and Thread website, I have learned more and more about needle arts. I am not familiar with Blackwork and would like to learn. The love birds is a sweet design. The online class sounds perfect for me to learn at my own pace with the benefit of more help than just a book would offer. I have not done an online class before, and that in itself sounds like a fun new adventure. The financial help of a give-away would be very helpful, too. Thank you. What an amazing opportunity! I love the idea of an online embroidery class as I live abroad and don’t speak much of the local language, so online is my primary source of interaction with the world. It also appears that embroidery isn’t known much here, so being able to take a class and talk with other people who enjoy embroider too would be a huge thrill for me. Plus, I would love to have a teacher that could show me some of the little steps that I can get the hang of on my own. Mary, you are wonderful! I just love that you can work at your own pace with an on-line class. I have taken several, in different subjects, and like that I can work them very early in the morning when I am enjoying my cup of coffee before the rest of the family gets up and the day begins in earnest! I LIKE that on-line classes allow me to work from home–no driving to/from, no parking difficulties–and you can easily SEE and HEAR what the teacher is instructing from the comfort of home! I’m interested in the online classes because my husband jut received a lung transplant and I need to stay at home with him during his recovery time. I’ve always been a fan of embroidery and now have the time to pursue it once again. I’ve enjoyed your website and getting the email with all the tips. Thanks for giving me something to keep me busy and that I can always have on hand. I’m very interested in learning about blackwork, there have been so many beautiful examples in needlework magazines recently. An online class not only lets you go at your own pace, you can go back over sections as needed to assure you understand. As you develop skill, you can repeat or reinforce your learning from the class. An in person class doesn’t give you these options. As we all learn at a different pace, the online class allows each learner to progress according to her own needs. It’s the best of both worlds. I have a demanding schedule that changes daily. This would be perfect in that it would allow me to be more flexible. It’s impossible to attend classes though I love the interaction with others. We have an animal care clinic and we treat birds. I would display this in reception! This is on my bucket list. I would love to accomplish a pattern I can share with my granddaughter. Thanks marywallis. I love the “anytime” aspect of online classes. Also, being a beginner, I know that I will need the extra time and the one-on-one that is possible. I love that online classes give you great access to not only the course material but input from the teacher, but you can work at your own pace, and review material anytime. You don’t need to feel rushed. Also, the cost savings and convenience of not having to travel and tote all of your needlework supplies is wonderful. I would love to take the on-line blackwork class, on-line classes appeal to me as I can fit the work in to suit my busy life. Hi Mary, I would love to take this class as shaded black work is one of the techniques I want to learn in my embroidery endeavors. I already know how to do regular black work. The aspect of an online embroidery class, that I like the most, is the ability to sit down and stitch whenever it is convenient for me. I am a busy mom with chores and kids and I have to find my own times to stitch after everything is done. I probably couldn’t find time to go to a class in person. It has got to be the flexibility of the online class that appeals to me most. Life has a way of becoming far too busy when I’ve made plans, so this method of instruction is the perfect solution! I am simply dying to do that elephant! I bought a project from Tanja not too long ago, and I saw it then…and have been drooling over it ever since! Needless to say, the elephant is quite daunting, but I think these lovebirds would help me overcome my angst and tackle the project. I have an exquisite ivory carving of an African woman that my father got in Liberia in the early 40s, so hanging above her would be the perfect spot in my house to showcase it! Fingers crossed! I’d like to expand my limited repetoire of stitches. This looks a good way to so this. After reading your post on “Advantages of Online Embroidery Classes” I’m totally sold on it! I would love to learn this method of embroidery online so I can do it at my own pace (I’m a slow learner) without having to rush. The aspect of an online embroider class that attracts me the most is the flexibility. With the busy life that most of us lead now days, being able to sit down and do it at a time that works best for you instead of a set time like a face-to-face class.Some of us are morning people who would love to stitch as the sun comes up, some of us are night owls who prefer to work while the moon is high in the sky. You can sit and work/learn at the time that best works for you. Yes, you miss out a bit on the social aspect in some of them, but many have a dedicated email list or website where you can still capture that flavor. Definitely the flexibility – working in your own home, at your own speed with the option to revisit areas where you need more time or help. You cannot beat that! Also the whole idea of having a professional stitcher as your teacher – I live in northern Canada where I don’t have that option in ‘real life’. I like being able to work at my own pace and also have a critique of my work. I also enjoy seeing others work and creativity. Online is my only possibility. I have a sick husband, a 95 year old mother,and two kids with Down Syndrome who live at home still. I did take the whole crowd to a one hour class recently. We had a good time, but the poor instructor was a bit overwhelmed. So online sounds better. An on line embroidery class attracts me because of travel and destination expenses. I’m on a fixed income and travelling to places to take embroidery even though I’d love to just isn’t in my budget. Also taking classes on line I can go back and re read as many times as I want\t to get the drift of the instructions and I know Tanja’s reputation as a teacher I’m thinking about taking this class because its another technique that I would like to learn it seems complicated but I don’t really think it is when you get the hang of it. Thanks for the opportunity to win this class. It looks really neat. Tanja Berlin is awesome. Blackwork is awesome. Also, the flexibility and ability to revisit. I love learning at my own pace, and have been anxious to explore other types of needlework from a variety of teachers. After seeing examples of Tanja Berlin’s needle painting and blackwork, I know she’s an expert! just finished a bargello class. after being self taught for 30 years, a class showed me how much easier it is to grasp the concept and makes the work even mroe rewarding. I would love the try , now, an online class. Blackwork is on my needlework bucket list…. I have followed Berlin’s website, there are so many items there to wish for. I would like to try a online class because I like the flexibility of it. When you take an online class, you can sit and stitch and learn “whenever”! In my jammies on the porch at sunrise if I want. The pace is your own and I can replay any parts of the class. I like online classes because I can do them in my own time in my pajamas! I love on-line classes for an opportunity to learn from the best of the best teachers and to learn specialized techniques. I would love to win this class! I think working at my own pace is what attracts me to an on-line class. I miss getting to meet other people in the class in person, but in some ways it helps me to just focus on the work. What a wonderful give-away!!! This sounds like an excellent opportunity to learn a ‘technique within a technique’… I’ve been doing just the very basics of blackwork for the past several years, and would love to have this opportunity to learn from Tanja!! I just realized that I did not answer the question about what aspect of an online class that I like the most…. That’s easy to answer… I don’t have to get out of my pj’s!!! Concentrated quiet is the aspect of online classes that appeals to me the most. Classes always have people talking or interrupting my aging ability to concentrate. Too much social in the learning experience and something always gets missed. I love online classes because in my place you don´t find where someone dedicates to teach others. And this could be the only way to learn propperly blackwork or any other tecknique. Apart from that, is very valuable the opportunity to learn without lating (I want to say the other students have to wait for you)your partners. Thank you very much!! Sincerelly, Paula. I love the access to teachers who I might never get to see in person. This brings me one step closer to the world of the RSN!! And Tanja’s work is simply stunning – I’ve never really considered blackwork but these images make me want to start right now! If I had to pick one reason, I would say I like the aspect of being able to return to the lessons at any time during the class to fine tune my skills. Sometimes (ok, often times) I need to re-read/re-do multiple times to understand. Thank you for the give-away! The love birds look so sweet. The attributes of online classes that appeal to me the most are flexibility and the lack of travel. Those are a must for me as a working mom in a rural area! I like on-line classes for several reasons. First is they are more economical for me as we are on a fixed income, and if I want to stitch in my pj’s or in the middle of the night, I can do so. I don’t need to feel that I am holding anyone else up if I’m having trouble with on particular area. For me, on-line classes are perfect. While most of the embroidery I do is Brazilian, I love counted work. This would be an opportunity to really explore it. I love the flexibility of on line classes. I work during the day and am not able to participate in as many classes as I would like. Thanks for making this offer available. I enjoy your tutorials and posts. Would love to learn this technique !! Omg–I love black work and love those love birds. I’d love to stitch them. Ooooh, I’ve always been fascinated by blackwork. Such an art! I like online courses because I can do them at my own pace. With my crazy schedule, that’s wonderful! I am absolutely in love with the idea of trying blackwork (I’m a beginning embroiderer) but I’ve been a little hesitant to try it on my own because I have needed a bit of time to get the traditional stitches down (I would have never been able to make it this far without your amazing website, Mary!). This would be the perfect opportunity to learn and the love birds are just so incredibly adorable — the perfect start! Oh, just realized I might not have been specific enough about the online class aspect — I study abroad and can’t make it to the classes that I would love to attend, this would be the perfect chance for me to learn from an expert despite the time changes!! With an online class I love the flexibility of working on it when my schedule permits. I work full time and getting in new learning experiences can be challenging when that time is limited only to evenings and weekends. The flexibility to work at a liesurely pace appeals to me as well as the ability to communicate with other participants as well as with the teacher. You are right about Tanja – her kits and instructions are top notch! She is fabulous as a face to face instructor and I would love the chance to do an online class with her. The lovebirds are so cute! I live the combination of colours! Thanks Mary and Tanja! On line classes opens a whole new universe to learn and try different things. From different teachers around the globe. Many classes are not available where I live. When they are they are held at times when I am at work. Some classes are held over a period of days or weeks – online training allows me to learn on my schedule and at my pace. No travelling, hotel rooms, gas costs, etc. etc. I like the pace of an online class. I am able to take time to really read and follow the instructions. I like being able to focus without a lot of distractions when I am learning something new. The flexibility to work on a project at my own pace as well as the ability to contact a teacher at any moment to get help if I’m stuck. I would love to win the kit and be able to learn blackwork embroidery. Wow! That elephant looks like he’s ready to walk right into the room! Blackwork has fascinated me since I first joined the EGA, but I have not been able to figure it out. I have taken a couple of beginner classes, but the “penny hasn’t dropped”! Maybe it will this time, I hope so! The flexibility of being able to learn on my schedule is important, especially now as I’m faced with significant time consuming and unpredictable elder care needs. Working on a whimsical project like the Love Birds will brighten my day! Love the idea of online classes because I can watch and learn on my schedule. If I want to sit here in my pajamas at 2am, no problem. If I only have 10 minutes, or want to sit here for 3 hours, no problem. The idea of online classes gives expert instruction in the most convenient manner of delivery. Online classes are great because I can easily fit them into my busy schedule. Plus there is a great opportunity to connect with other like minded embroiderers!! Thank you for this opportunity! I like online classes because of their price, they give you access to teachers all around the world, and you can watch them at your leisure. You can replay them over when your not sure you understand. I like online classes because they let you chose when your time is available .Also I have tried Blackwork before and never really did it correctly or to my way of thinking and with this I would be doing it correctly. I’m very curious to take an online class. Nice to work at your own pace but also have a deadline to work to so it doesn’t become another WIP in a drawer. I’ve taken a class with Tanya in person and really enjoyed it and would do so again next time she comes to our city. What appeals to me is working at my own pace, having notes instead of trying to remember verbal instructions, learning from the work of others which for me sometimes clarifies something I don’t understand. And, living in small town Canada, the cost of travel and accommodation is beyond my ability. Online covers all bases! There are several aspects of online learning that attract me. First with a hectic life style I don’t have the time to just up and leave for a class. With online classes you can work at your own pace at your own convenience at any time of the day. Also you can learn from the best of the best internationally recognized teachers. Lastly, the classes are economical. Online learning is fabulous. I have never done blackwork, but will be taking it in about a year as an Intensive as part of the Certificate course at the RSN. So I need to start to learn and practice is I can design my project and pass. There is no where locally for me to learn, so I need an online class! Better than trying by yourself from books. Best part would be the hand holding by an expert!!!!!!!!! That alone would provide the constant encouragement needed for something new in a busy life. Just a mouse click and I could get going on something that looks so involved and stay attached to the project directions any time I want. Thanks for the opportunity. I am glad to be able to do the study any time of the day that I have free. What a great way to get expert feedback on my work! I live in the middle of nowhere and do not often have access to a class or teacher. I cannot drive so travel is limited. Online classes give me the chance to learn new things. When I saw this picture, all I could say is “Wow”. I have done some blackwork, but nothing like this. I loved the use of the reds and yellows as accents to the black. What a wonderful class. WOW! I’ve seen this work before and it just bows me away! I’ve only d9one traces of blackwork to augment other stitching. I’d love tot tackle such an intricate looking piece. And, of course, the birds are totally cute! this sounds like a wonderful opportunity to learn blackwork. The penguins are so darling and I am madly in love with the elephant. I am keeping my fingers crossed. Thank you for this chance! I am attracted to online classes because there are no embroidery or quilting classes held near me and I cannot afford to travel. I am like blackwork, but I am totally mystified about stitching the patterns. I don’t understand the stitching order. Tanya is the quintessential blackwork instructor. I met hard several years ago at an EGA national conference. Class online would be wonderful. I have taken classes in person at seminars and love them, but it is very expensive to travel, pay the lodging and meals and then all the costs of the materials, tuition and rubber chicken dinners at opening night. I love the idea of taking an on line class and have never tried blackwork. I’d love to learn blackwork and what a fantastic way to learn it – in my own time and space and from a master as well! Thank you so much for offering this amazing opportunity. I would love to learn blackwork – it is one of the techniques that I want to learn and having looked previously at Tanya’s website I’ve been hoping to have the opportunity to learn with her. Doing an on-line class gives me the opportunity to access some of the best teachers wherever in the world they may be; to be able to do it at my own pace and to fit it around my other commitments is a joy. The design, naturally, is gorgeous! The thing I like about online classes is that you don’t have to worry about being at a specific place at a specific time. You can sit right at home and whenever you’re ready, take the class. That elephant is amazing! Those birds are so cute! The guilds and needlework groups in my area are too far away to conveniently attend. Workshops and seminars are now few and far between and often don’t fit into my schedule or are too expensive. Having taken the strawberry online class you recommended last year I was pleased to be able to follow the excellent instructions and found that my skills were expanded by these simple, straightforward instructions. Blackwork is one of my favorite techniques, although I have done very little. The use of a single color, or just two or three, combined with straight stitches to produce complicated and unique designs fascinates me. This online class, taught by an experienced teacher, will certainly expand my skills, but will also provide much needed instruction that I will never be able to get outside of the internet. Thank you for offering this kit and telling us about the class. I think it is the idea that i can do it at my pace, when I want, and as I need review. An online embroidery class appeals to me, because it allows me to learn at my own speed. I am able to go over any areas I want to review and skip forward parts that I am familiar with. On line learning is a terrific way to take a class. Simple, quick, lots of new stitching friends, plenty of time to absorb the materials being taught, no travel hassles. I have taken a live needle painting class with Tanya and she is a fabulous teacher. I love black work but am intimidated by it. Participating in an online class sounds ideal, because you get to work at home yet get knowledgeable supervision at your pace. I love to go to seminars and classes however I work full-time (plus) and there is not enough vacation time to allow for my passions. As you mentioned, it is also expensive although very fun to be around so many people with the same interests. I’ve taken a few online courses and find they are very informative and fun. I learn from the teacher as well as other students. I am a long-time fan of Tanja Berlin. While I’ve not taken a class from her I do have her pansy thread painting kit and still need to dive into that. I’ve heard Tanja speak and know from my friends she is an amazing teacher. Blackwork is one of my favorite techniques so would be wonderful to get much better at shading. In this case the number one draw for this class is Tanja! In general, online courses allow flexibility in time and budget. I’m living a busy retirement so really can use the ability to plan the stitching time to meet my schedule. Of course, being retired means I also need to plan my stitching budget carefully and appreciate the cost effective nature of online classes. When compared to correspondence courses, online classes allow prompt help from the instructor. A real benefit when you’re looking at something you’re not happy with but don’t know how to correct the problem, or perhaps even what the problem is! Thanks for the opportunity to take this class. Online classes are perfect for those who work everyday ever changing hours. It allows you to do the classes any time and also to go back to specifics that you may need to re-study. Thanks for the chance to win this lovely course. I like online classes, because I find it hard to find a good, qualified embroidery teacher where I live. With attending a online class I can have the benefit of her knowledge. And if you have contact with others following the same class you can still make friends, all over the world. 1. What a way to get a special one on one class. 2. This will be an opportunity for a home bound individual to get the most from a class. 3. And last but not least, I love learning something new and black work will be that one project that I would learn, having never attempted black work. 4. Thank you for all that you offer to those of us confined to home. In glancing through a few other comments I see I am not in the minority for liking the flexibility and coaching available through online classes. I’m working my way through the Blackwork Journey (a couple of months behind…) and would love the opportunity to take the next step into shading. This is a great giveaway. The appeal of online classes to me is that I can work at my own speed and don’t feel tied to a classroom for “X” number of hours for a class. I can work at my own pace and if I am having difficulty with a particular stitch I don’t feel like I am “falling” behind in the class or holding the class up when the class is online. I love the flexibility of online classes. I have been interested in learning black work embroidery, and have found no one in my area teaching that, or much of any kind of embroidery. Thanks for the chance to participate in your giveaway! All the reasons you outlined for an online class are why I would love to take this class. I am retired and have to pick and choose the workshops and seminars for the cost, travel is expensive and an online class would solve that problem. Also, I find the Oder I get, the more one-on-one attention I need! When I teach a quilting class, I make sure every participant gets as much of my personal help as she needs. Thank you for this opportunity to maybe participate in an online class for a technique I have never attempted! I have never taken an online class before. But the idea interests me. I like the idea of not having to be there. I travel a lot and I like the fact that the online classes are portable. I love on-line classes because I can stitch whenever I can fit it into my day – or night! The ability to snap a photo and get feedback is great, and typically instructions are well thought out because the teacher isn’t there to walk you through a difficult part in person. The best part of an online course is that you can download the lessons and revisit them whenever you want. I attend at least one EGA seminar every year in addition to participating in chapter-sponsored workshops. Online classes allow me to experience teachers and techniques that I might not have the opportunity otherwise if I waited for them to be offered traditionally. Moreover, as some of the most popular teachers decide to retire from traveling, this may be the only way to gain their knowledge. And there’s no limit to the number of students. It’s a win-win situation all around! I love online classes for the simple reason that you can work on them at your own pace. I am a very slow stitcher so online classes allow me to take my time and not feel rushed (or embarrassed for being so slow). I have taken three of Tanja’s online classes and believe me, they are fabulous! I learned so much from Tanja, not only from her comments to me, but also from her comments to the other students who participated in the forum. It is truly a wonderful experience and I would highly recommend an online class to anyone! Thank you so much for the chance to win this class and kit! I’m not exactly sure what blackwork is but would like to learn. I thought it was basically using black thread for the entire project, but I think I’m wrong. Anyhow, would love to try an online class and have been hesitant to do so. Sure would be nice to win! Having just finished my first online knitting class, I can sing online classes’ praises! For me, the advantage was being able to go back and watch something that I was having difficulty with over and over! The convenience of being able to sit in my pjs and not have to go out was also appealing! For teachers, on-line classes provides access to so many more people than face-to-face classes, spreading the joy of needlework, in all it’s many forms, to the world. For students, the accessability of the teacher when the class is oficially ended is also of great benefit. Many on-line teachers keep the class site open for at least 6 months, allowing those who weren’t able to complete the project to still reach out to the teacher, other classmates, and the up-loaded material for further reference. I love blackwork embroidery, in fact embroidery of any sorts! Having had to care for both of my elderly parents for many years and having recently been through a particularly stressful time with my father being in hospital for 3 months, I have not had the time to do much embroidery. I would love to be able to go away on a dedicated embroidery course but unfortunately I need to be close to home. An online course could give me the flexibility I require and the escape I so desperately need to follow my passion. I’m a full time watcher of on line classes. I’ve done a lot of embroidery because of your on line instruction to so many new stitches. I also take quilting classes on the internet. I live on a fixed income and have a hard time getting around so this is perfect for me. I would love to have a chance to win a free class. I have a 10-month-old and work fulltime – so I really have two fulltime jobs. The only way I can get to a class for the next 5 years is an online class. I can do those late at night after she’s in bed – and if it’s a night that I can’t stay awake, I don’t have to miss the class. Also, for those of us who are less than social, it provides a great way to learn new techniques without the pressure of a social environment. Hobnobbing can be fun, but sometimes, I just want quiet. I enjoy doing blackwork, but haven’t done any for quite some time. Absolutely love that elephant. This would be a fabulous class to take (or even win) … I have taken online embroidery classes before and I love the fact that I can work when I have time (or best daytime light) and leave the instructor a note any time a question arises. I love to take online classes – they give me a chance to learn new techniques in the comfort of my home with a teacher available for help, if needed. There is no travel expense or time constraint to completing a days assignment, I can progress at my pace (whether it is faster or slower than the class), save the notes on my computer and review then at my leisure. I don’t have to worry about homework at night getting ready for the nest day of inperson class. The ability to do this from the comfort of my own home; also having instructions I can have in hand for future reference as well. It would also be nice to correspond with others taking the course to learn from others comments. I like the flexibility of online classes. You can do them when you have the time. I like all the shading with the black work. I think the most attractive aspect of online learning are the flexibility, avoiding the cost of travel, and the accessibility of the instructor. I work full time and then help run my husband’s business, so time is a precious commodity. The opportunity to have direct feedback from an instructor is a huge advantage. I’ve been teaching myself so far, so that would be an amazing opportunity. More specifically to this class is that my current explorations have been in blackwork. It appears deceptively simple at first, but I have fallen in love with the challenge (as with all stitchery I’ve tried so far). I would love the focused opportunity to learn shading techniques! I recently purchased the RSN blackwork stitch guide and I’ve dreamed of taking some of their courses, but living in the U.S. means that won’t happen for a while (even if I go to L.A.). The chance to learn from one of their graduates would be the next best thing! I like the flexibility of online classes as I do work full time. It’s also a great way to virtually meet other stitchers from all over the world. With age and health considerations, it’s no longer feasible for me to travel to take classes, but my hands still work, and I love learning new embroidery techniques. In on line classes, I’ve been in touch with people from all over the world who share my interests, and I’ve discovered new ways to use my needle and thread. My first experience with online stitching classes with you. What I loved about it: the clarity of the instructions, the great illustrations, the availability of an instructor to answer questions, and the fact that I have it forever. How many things can you have FOREVER? Thanks for the heads up about this. I have not tried an online embroidery class before, but it would be nice to be able to work at your own pace, and to be able to go back over things as needed. With working 2 jobs and trying to finish planning my wedding in November, being able to work at my own pace would definitely be a benefit! I am definitely planning on doing Tanja’s elephant to add to my collection when it comes out , so it would be an added benefit to be able to do the lovebirds class beforehand. I like online classes because I can work at my own pace and you can finish once part before you go on to the next part. Taking instructor led classes are frustrating for me because I just get started on something and they move on to the next step. Since I read directions well, I often do not need a lot of help but it is great when there is an instructor “on call” when needed. I have never taken an online class before. I think that you would have an opportunity for more of a one on one learning experience plus be able to go back to review what may have been missed or not understood the first time around. You have to opportunity to work on the class at time that is good for you and your schedule and at your own pace. It all sounds good to me. I love the idea of an online class. I have never taken one. I love all areas of needlework and am intrigued by black work. What a beautiful piece!!! It’s hard to narrow what I like most about online classes! I think it would have to be the convenience of working at my own pace and when I can fit a lesson into my schedule. I’ve been interested in blackwork for some time. This would be a great start. I love online classes, because of the convenience. I don’t have to drop everything and run to a classroom (even a local class means having to work your life around someone else’s schedule). I can pick it up when I want to, when I have time; even in the middle of the night, if that’s when it works best, for me. Blackwork – so far am self-taught and love it. Would love to do an Elizabeth blouse! I love the simplicity and complexity of blackwork. What attracts me is a chance at a class with Tanja. Met her at Seminar this year in Ottawa. She is a lovely person and, I imagine a splendid teacher, but her classes quickly fill up at any conference.! A chance at this prize would be a super birthday present ! Do you feel your emotions being tweaked? I saw the elephant at Seminar – it is so wonderful!!! Beautifully done. The things that appeal to me is you can work somewhat at your own pace and you can keep referring back to prior parts of the class as needed. The lovebirds are so adorable, and in an interesting technique. I have been admiring both the lovebirds and of course the elephant. I keep telling myself though that I should learn the basics before tackling the gorgeous elephant. Thanks for such an interesting article on blackwork, online courses, and a Canadian designer. Happy stitching, Nicole M.
I love online classes. I like working in my home and sometimes in my pajamas. The most important reason for me is everything in the class is usually typed out. I am Deaf and have trouble understanding what people are saying, so when it’s typed out, I don’t miss a thing. That’s why I prefer online class to taking them in person. The beauty of an online class is the ability to learn from teachers I otherwise would not have access. The most appealing aspect of online classes is the ability to attend without travelling. I love to travel, but my current situation prevents that right now. With an online class, I can join a group, meet some new people, and learn or refine my stitching skills all from my own home. I have never taken an online embroidery class so that is what attracts me the most. I don’t know if you have to keep up with each day’s work, which would be difficult, or if you can print or save the lessons so you can go at your own pace. It would definitely be a learning experience for me. I just love the idea of a class. I learned to embroider at around age 5 or 6 and have never had any classes. I don’t even know if they had them in the 60’s-80’s. I think it would be a great way for me to advance and learn more instead of being stuck at the same level that I’m at. I love online classes. especially tanyas..they are very well explained and anytime I need help she was right there..you can do the lessons on your own time and there is no pressure. I love being able to go at my own pace. I am recovering from a stroke and my love of embroidery combined with detailed instructions is just what my recovery needs. I took Tanya’s Pansy class earlier this year. I was very slow and not so perfect, but the fine motor work was excellent for me. And I loved it. I love her elephant and am interested in faces. I stitch slower then a lot of people, usually getting behind in regular classes. Before I have complete concept of one thing it is on to the next. It is not bad to stitch slower – it just isn’t something I am in a rush to do, since I stitch for enjoyment ( as we all do ), some people are just more speedy. Especially in a new or different technique like Blackwork would be for me. An online – at home class is perfect for me. I can work one thing at a time and when I need to ‘just lay it down’ for a few min to take a break, I am not getting behind. I can work on it anytime, along with other projects I have going. Yet, the instructor is always there when I need her and still have class discussion and questions from others answered. Winning this class would be wonderful, I would really like to learn more about Blackwork. Thank you Mary & Tanja. I like the idea I can work on a project when I have time and not when a class is scheduled. To have the classes broken up in parts means I have the challenge to go as far on a project as I can, but also it will keep me on track so I continue to progress with the project without having another unfinished project. One of the great advantages of an online class is having the opportunity to take a class from a respected international teacher in the study of a skill that you would like to learn or improve upon. I have always wanted to take a class from Tonya Berlin and in particular have been looking for a blackwork class. Even better, you can do it at your own pace and on your own time schedule. And there are no travel costs so it’s economical too. There really is no downside as you can communicate with the teacher as much or as little as you like. Online classes offer quality instruction for reasonable expense. They also allow me to learn new techniques from experienced and available instructors. I love accessibility of an online class. Anyone from anywhere can take it without having to leave the comfort of home. I think the best thing about online classes is being able to work at your own pace and according to your own schedule. I love on line learning because it gives me the flexiblity access the course content when I’m free, which is usually later at night or early in the mornings. Thank you so very much for offering this! It is a wonderful opportunity. Sounds like just the ticket for my need to start a new project. Fingers crossed. Blackwork is so interesting and I love using different skeins of thread that give a 3 dimensional quality to the finished work. This online class will teach me a way of doing blackwork different from the counting method. I’ve done several online classes and prefer it. Because of commitments and other restrictions, traveling to classes are rarely possible. I’ve had success with online classes. [All except one, which was a technical glitch on their part for which they offered a refund/redo. I opted for the redo.] There are so many advantages: excellent teachers, insight from participants, no time restrictions, etc. For me, the most gratifying aspect is to know that I am a part of a worldwide gathering of like-minded needlework lovers, a win-win. I live in a small town with no cross stitch store, so no classes. I first took classes through a needlework show 5 hours drive from home. When that went bellyup, I joined the Embroiderer’s Guild of America. But that meeting is also an hour and a half from home. Then I discovered online classes! Woohoo! I love the flexibility, I don’t have to travel, the detailed instructions, some offer video. Just a great new way to keep learning. Thanks for this wonderful offer. I love the online classes as they are affordable and flexible. I don’t think in this particular case to be able to have a class with Tanja as I can’t afford to travel to Canada. I have been to several EGA seminars over the years and agree on all points both pro and con. I have never taken an on-line class. But, after reading your comments, I feel that this would be an excellent way to learn a new technique or acquire a skill at a higher level: time to concentrate on one specific area if needed, a chance to stitch when the house is quiet, a time just to get up and walk away if needed and a chance to ask questions that are “my” questions. I have been doing Blackwork for several years and am quite enamored. In fact, my license plate is “I 310work.” (Makes for some interesting conversation.) However, I have been hesitant to progress beyond the basic designs. If I were to take this class it would help me move to the next level with confidence. Working with my schedule is most appealing. There are some days that I fully intend sitting down to stitch – right until it’s time for bed. Sometimes it’s hard to carve out time with so many other demands on my attention. And a class that I can go to when I have the opportunity would be perfect. There is the opportunity to interact & learn with the instructor & other students while having all of my own supplies within reach at a time that is convenient to me. Tanja Berlin has taught me so much indirectly over the years by sharing her work on her website. When I first returned to embroidery, I studied her detailed pictures for hours & made copious notes of how she accomplished specific details to achieve a desired effect (in particular the two dogs). Then she stopped doing her website & blog for a while, and I lost track of her. How wonderful this opportunity is made available! Wow, this is something I wanted to learn since a long time. An opportunity to have online class is perfect. You can go at your pace, the flexibility, ask question at any time… What else is more suitable? Having the teacher beside you at any time with the online classes is the best. The aspect of online classes that I find most attractive is being able to work in the comfort of my own home (I’m tethered to my oxygen machine so travel is out of the realm of possibility) at my own pace. I can go just as fast or slow as I need, and not worry about slowing anyone down. The ability to have such great access to a very talented instructor is a great boon, too! Thank you to all involved in this generous giveaway! The most appealing aspect of online learning is the flexibility it offers. Generally I do not get a chance to sit down and stitch until fairly late into the evening. So to put on my jammies, get comfortable with a glass of wine and begin my stitching is perfect. No schedule to meet or no need to have my hair perfect, just pure satisfaction of learning a new technique at a convenient time! I am always excited to learn new techniques and the ease of doing so from an expert and online are equally exciting. Thank you for the opportunity. Wow, love the Love Birds…they look amazing! What a wonderful prize! I love the flexibility the online class offers. I have mobility problems and am not always able to go to a class, so online classes are a marvelous way for anyone to learn how to embroider , in their own time, no matter their circumstances, time restraints or disability. I love Tanya Berlin’s stuff. The opportunity for an on-line course allows me to participate without having to pay the additional expenses for travel, hotels, class fees, etc. that are attached to an in-class session. I was lucky enough to be able to participate in a class with Tanya instructing a Hapsburg Lace session a few years ago and would love the opportunity to do one of her classes in blackwork. I’ve never taken an online class but would like to take one. I love the idea of being able to attend on my schedule. Thank you, Mary, for offering this wonderful give-away. I love online classes for mostly the same reasons everyone else has listed (including the frequently-mentioned pjs factor!). Learning a new technique takes lots of concentration (at least, for me! ), and I’m less likely to be confused in the quiet of home than in the fun social atmosphere of a group class. The ability to work at our own pace is also incredibly helpful. Have been collecting blackwork patterns but have not felt confident enough to start a project. An online class gives the freedom to pace myself and really learn the techniques involved. All of Tanja Berlin’s projects are beautiful but the birds are adorable. What I like most about on-line classes is that they are done in “My-Time”. The cost factor is a close second. What I like most about this class is that it will help prepare me for the EGA Group Correspondence Course (GCC) “Roses” by Carol Algie Higginbotham, my EGA chapter (York White Rose) is planning to start next year. I will sign up for this class, win or not. I am interested in learning about shading in black work. Oh, how lovely. I live in the midwest, and it always seems that all the interesting workshops and meetings are on either coast. I love the idea of being able to play along with people from all over the world, right from my own home. I have been wanting to try an on-line class for awhile, for all the reasons mentioned: at my own pace, replay lessons, affordable way to have a teacher who is an known expert in their field. I have also wanted to learn blackwork, bought a few books, but have not quite gotten as far as actually doing it. Thanks for the giveaway & all the wonderful tutorials offered on your website, I visit it often. I really like the idea of on line classes. It opens the world of learning embroidery (or almost anything) to those who can not travel due to expense, age, health or work. I work full time. I would love to attend a seminar but this is not available to me while I work. With two kids at college/university, money is tight too. In this age of technology, I really think the on line class development is one of the positives of our technology and will continue to grow in time. It’s been a couple of years since I have done any stitching because I have been sewing garments instead (so much fun!). I’m having surgery on my foot in a couple of weeks and will be non weight-bearing for about 10 weeks. What a perfect time to return to needlework! Just sittin’ with my foot up, stitching, reading, stitching, reading… my husband waiting on me hand and foot…(You can see I’m trying to keep a positive attitude). I have done one of Tanja’s needle painting kits, and she is the best there is. I’ve never done blackwork, but I have always wanted to. I love the geometric look of it. I still read you every day,even though I’m not stitching! And just when I was contemplating buying books and ‘struggling’ with teaching myself,Mary, you provide a chance at instruction! Having taken a few online classes before, I like the flexibility they offer best. Interaction with instructors, planning your ‘stitching time’ around your other demands, and not commuting are all important to me. So, here’s throwing-my-hat into the arena of names . . . I really like being able to come back to the class at my convenience nad also to be able to go back and review areas that I need help over and over! Gosh….there are so many reasons to take online classes and you covered quite a few in your blog. On a personal note, I am retired and the thought of travelling (whether by air or car these days) is a daunting prospect. Just not comfortable any longer in such a daily change of life. Also I now have osteo-arthritis in my knees and that pretty much eliminates the idea of long term travel. What a lovely way to learn in front of one’s own computer!!!!!! As to why this class, I love doing blackwork and have completed a few small projects over my 40 odd years of stitching, but would most definitely like to move onward and learn shading etc. I follow the RSN in e-mails and would love to learn anything they can teach me, so learning directly from Ms. Berlin would be such a treat and one I could not really afford!!!!! Thank you for giving us such an opportunity. Well, I have some physical challenges, so an online class removes a lot of the barriers to participation. I hate toting all my stuff to a class, and I can’t always be sure of the environment when I get there, allergy-wise. So, while I do miss the camaraderie of an in-person class, with an online class I can be sure that I’ll be able to stay until the end! Plus, I’ve been eyeing Tanja’s kits and classes for a while, AND I’ve been thinking that a blackwork piece like this would be perfect for a box I have, so, my fingers are crossed! Thanks for the opportunity, Tanja and Mary! May I cheat and highlight two equally important aspects of online classes to me? As you noted, there is the flexibility that allows me to fit it into my schedule, which is very important given my (and most everyone else’s) pressing responsibilities. But equally important is the community that is built among the students in such a course which – unlike most standard classes – tend to continue beyond the conclusion of the class, because it exists in the same space where it was initially created: online. I’ve recently completed a monumental piece of work, and the only reason I persevered and finished it in the period I did was the support from the online KAL community. Adding an aside, I have been fascinated by blackwork ever since I was introduced to it, and in my work (at the time) in rasterizing and image rendering could see so much in common, albeit on a totally different scale. I like being able to go at my own pace and skip days as necessary, rather than having to devote a whole block of time at one time. Hi Mary, An on-line class gives me the opportunity to have continuing education in embroidery. Where I live the embroidery classes are too far away so these on-line sites are a heaven’s sent. I am having surgery soon and this would be a great time in recovery to participate in one of Tanya’s classes. These two blackbirds are as cute as can be in Blackwork. If I win, I wouldn’t be humming “Bye Bye Blackbird” anytime soon. I have long been attracted to blackwork, but I have not tried it yet. I do a lot of free style embroidery and some mixed media. I have been too aware of the possibility of such precise-looking stitching as blackwork ending up a mess if I do it, so I’ve not signed up for a class where others might see my mess. Thus an on-line course seems to be a good opportunity to find out if I can do this technique. Besides, I love to embroider birds! I like that you don’t have to travel. Being disabled, this figures largely in my ability to get classes. I truly love taking online classes. Being on a fixed income allows me to use my extra money for the actual class and supplies instead of travel expenses. I have everything I need at home right at my fingertips. I have taken several quilting courses on line as well as sculpting clay heads for creating dolls. I have also taken fine art colored pencil courses on line. They all gave me the ability to work at my own pace, learn new techniques and gain confidence in my work. I have tries several times to teach myself Blackwork. Even though I can cross stitch and embroider it alludes me. I would love to win this course. If anyone could teach me it would be Tanja Berlin! Receiving instruction from a top-notch instructor is definitely an advantage of an on-line embroidery class – how many of us have access to the teaching of an amazing artist whenever we want? For me the crucial thing about an on line class is being able to both source a new skill you have always wanted to do with the help of an expert you would otherwise never be able to afford. The other huge advantage is the fact that you can go over and over the points you struggle with which would really not be available to you in a class situation where there will be many delegates all wrestling for attention and finally doing it at a time that suits you. Win win all the way really. Thanks again for this generous opportunity. I have drooled over Tanya Berlin’s website ever since I first encountered it. What an honor it would be to take one of her classes. Others, beside you Mary, have waxed poetic over her superb kits and superior instructions. Thank you for providing this opportunity to win one of her kits. I like the idea of an online class (my first was Mary Corbet”s) because i was able to work on my schedule and i didn’t have to leave the house to do it. Also, you can review and apply the same principles to other projects. I am a needlepointer embroiderer however, i have never done a project in strict blackwork. This would be a great opportunity to do so. So many obligations, so many interruptions, so little time these days—the best part of an online class is the ability to work on the lessons whenever I choose. Online classes are, for me, fantastic. I have done several and am slowly developing myself using this format. The best thing for me is the flexibility as I live in Spain (where there really isn’t much in the way of workshops – if anything!) and it’s pretty hot here in the summer, so I tend to work in the early morning and late at night. Would be delighted to win this workshop, but may sign up for it even if I don’t!! The thing that appeals to me most about the class is just the learning. Being able to improve my skills and learn from such an excellent teacher. I love the convenience: on my schedule, no driving & can stitch in my PJs! Just starting working full time (finally after a long job search) an online class is ideal if I am to get classes in stitching at all. It gives the needed flexablity to go at ones own pace, even if it is very different from week to week. ROI–Return on investment! With online classes one gets a great return for a modest investment of $$, and the investment of one’s time and effort is flexible. I really appreciate online classes giving me access to artists that I never would have otherwise. I love having access to teachers all over the world. There are many teachers I would not have the opportunity to learn from if I was limited to those I could study from in person. An online class appeals to me because I live in a remote ferry access only area and I do not get the opportunity (unless at great cost) to travel to classes offered on the mainland! What a fabulous idea this is. The best feature of an online class is flexibility in time and location – as well as the ability to review/revisit material presented. Wow! What a wonderful give away! I love online classes. They afford me the flexibility I need and I can go at my own pace. Thank you. The opportunity to work with a expert teacher is very tempting. I like the ability to interact with the instructor as I need to and to receive individual attention and responses to my questions. I appreciate this opportunity to increase my skill and knowledge. Oh, I would love to win this! Thank you for the chance. Of Tanya’s classes some time ago, and she is a first class teacher. Thank you for the chance to win one of her classes. Sue in Bermuda. I have only taken one online embroidery class…from EGA. The idea of having access to the instructor any day of the week (almost) is very reassuring. I probably won’t stray too far from the right path. I have never taken an online embroidery class and would like to try one. I would imagine I would learn a lot more in the online course than in a classroom. Not only would you have access to the teacher but you have other resources on the internet right at your finger tips. I am going to look into the class because I want to learn Blackwork and I have a definite weakness for birds. I should say that I am owned by a bird (parrot). The freedom to go at my own pace is very attractive to me. I work full time and it is becoming increasingly difficult to take time off work, so being able to fit in a class around my schedule is helpful. I have heard wonderful things about Tanja Berlin and I LOVE this piece! This would be a great opportunity for me as I live remotely. Doing an online class is ideal as it can be done at your own pace and in the comfort of your own home. Thank you for the opportunity to learn a new craft in such a convenient manner. The thing that attracts me the most is that I can do it when it is convenient for me, plus I think the blackwork is so pretty and I have never seen it before. The aspect of online classes I like is the flexibility this would offer me. I have a long term spinal problem which effects my ability to do many things, fortunately this doesn’t include embroidery! I have booked courses in the past and had to cancel due to problems my condition causes. With an online course this would be eliminated and I would learn and enhance skills into the bargain. Win win! I enjoy online classes because I am in my seventh decade and find that I am not able to concentrate on my stitching when others are chatting around me, seems I’m interested in what they are saying more sometimes! Oops!-problems, always problems of some kind or another! I do love seminars but find I take more notes than trying the stitches while in class where I can get help immediately, (memory isn’t as great as it was either). So since I still enjoy stitching, this is a way that works very well for me. Thank you for the offer. I am fascinated about the shading techniques in blackwork. I haven’t tried anything blackwork, but this would change that immediately. I know exactly who would love to receive this project finished. Being able to review any instructions would be awesome. Setting your own timetable is the best when starting something totally new. As a New Zealander following Mary’s needlenthread site in New Zealand I am not sure if I can join an online class but would love a chance to try. I live in a little coastal village 45 minutes from Wellington with a couple of little craft shops within my area so am able to satisfy my embroidery love but find things are very ‘old fashion’ still and this does not stretch my ability to learn new techniques which this course would allow me to do in my own home, sitting in the sun. Online classes give me the chance to learn something I’ve always wanted to, but will probably never get the chance to in real life. I’ve never seen anything like this offered near me, and that sort of blackwork is something I’ve always wanted to learn how to do. I have recently started learning embroidery to give myself a creative outlet while cruising on our sailboat. Your website has been invaluable to me for stitch tutorials and inspiration. But the greatest fetcher to me has been accessibility. Access to book tutorials and classes while cruising is very limited. So I have come to rely on the internet. We don’t always have internet access, but when we do I study and review information that I then put to use when we are in more remote areas. I am ready to expand my embroidery skills and the accessibility of an online class is a perfect fit for my lifestyle. My most recent project was enhancing a Gyotaku fish print (made by a fellow cruiser) with embroidery. The blackwork shading sounds like a perfect fit to continue exploring in that direction. I can’t make up my mind about which I like more, access to someone who knows what they are doing or flexibility in the time? I need an emoticon that shows someone weighing something in both their hands! Since I have never participated in an online class before, I’ll have to leave the final answer in the “air”, so to speak. PS I am just starting a class and may soon have a more definitive answer. I love the idea of an online embroidery class due to the fact I work full time and the time I have to dedicate to my hobby is limited. An online class gives me the flexibility of setting my own timeline to learn a new skill…and at the end of it I have a lovely piece to keep or give as a gift. I would LOVE to win this class. I am working on learning Blackwork, hard at the moment with work ans hospital & do toes visits, but I will get there! I love the fact that I can work at my own pace and go back if need be. I’ve been collecting books and patterns about Blackwork for a few months now. This would be a wonderful opportunity to learn from a really gifted teacher. What attracts me the most, is that I can take the online class anywhere. I just recently moved to Austria, where I unfortunately do not have access to all the great embroidery magazines or craft stores. An online class would help me to have still the chance to learn new techniques. Flexibility. Usually classes are available at the student’s schedule and for repetition. At times, the class is available as long as the site is active. This makes online classes very attractive. On line classes open the door to a host of opportunities to new needlework skills. Blackwork has been one area that has intrigued me for a long time. The idea of shading with thread by increasing or decreasing a design element piques my interest. Just how do you do that? I’m a big fan of Tanya Berlin’s work and kits. I’m working on her gold work sampler, and have one of her Jacobean kits waiting when that is finished. Her instructions are complete, well illustrated and crystal clear, and if that weren’t enough, she is willing to answer questions at any time via email about her projects. Still, there have been times when I wished she would do an online class – sometimes seeing something done in a video just makes the whole thing click for me. If picture is worth a thousand words, then a moving picture, plus explanation is worth millions! Plus, being able to watch something done at close range, over and over if needed, makes an online course well worth the cost. I’m excited that she is doing this class, and can’t wait to take it! I’ve taken many online classes and they give you the flexibility to finish at your own pace and work from whatever venue you choose. This will be my first black work class as well and who better to take it with than Tanya. Thank you for the opportunity. You mean, I have to pick ONE aspect . . . ? OK, being able to see not just answers to my questions but also answers to other students’ questions and difficulties – things I might come up with later myself, but haven’t yet. I’m pretty good at learning things out of books, but it needs to be a pretty specialized book to answer the questions I don’t think of! I have been working on a blackwork pattern I got from Nordic Needle. I cannot figure out how to make my back as pretty as my front – you know the track you follow so that there aren’t any threads stretching over other threads. I would love an opportunity to learn how to do this needle art correctly. Thank you for offering this. I love online classes because I can take them any time that works for me, and because I don’t have to travel. The quality of the instructor. We can’t get a high level within driving distance. So online allows a higher level of instruction without having to travel great distances. Online classes are attractive to me for their flexibility. To have access to such talent to help me learn this craft is great! Thanks for the chance to win it! I love the idea of being free to stitch whenever I feel like it, while still having my tutor available. I’ve taken classes at the RSN, and sometimes it can be difficult to get the tutor’s attention. And also being able to check back on things I can’t quite remember! For those of us in rural areas, it can be difficult to meet others who enjoy embroidering. The Internet has allowed me to learn about new techniques and has made me realise that others share my passion for needlecrafts. Online classes are a natural extension of my own online research and represent exciting opportunities to be inspired by more experienced and knowledgeable embroiders from around the world. I could take the class in my jammies! I am part way through a British Embroiderer’s Guild on-line class (for beginers), and the next module involves Blackwork. The on-line course sounds brilliant ! …. P.S. I love the elephant ! Flexibility, comforts of home, being able to stitch at my pace, learning a new skill, always a warm pot of tea…what isn’t to like about this online class! Thank you for the opportunity to try something new. I have taken an on-line class and was impressed with the quality of materials in the kit and the detailed directions. Being able to work at my own pace and finish one section before moving on to another is an advantage. Knowing on-line help was available was also a plus although I didn’t need this assistance due to the quality of the instructions. A beginning blackwork class is where I need to start. I had taken a needle painting class from Tanja Berlin at a seminar and know her directions would be excellent. I have not really done much blackwork. Tanja is my Facebook friend and I would love to take a class w/her but I am STILL, after 5 years, recovering from Hurricane Ike & can’t afford many luxuries. On-line classes are convenient & Tanja will be a great instructor-it would be a lot of fun to learn blackwork from an expert. I could make my own class schedule which would help me immensely! Thanks for doing this! Whether I win or not, it’s a great idea! I really appreciate being able to do the course in my own time and place. I am in Australia so without the internet I would miss out on learning with the ‘greats’ of embroidery and art, like Tanya. My favourite thing about online classes is that I can do them in my pjs from the comfort of my home! Whoa! The good parts include access to the instructor whenever you need help and the way a good instructor makes the silliest and smallest and most repeated question seem totally reasonable. The BEST element is that I can work along and participate at 1, 2, or 3 AM when I’m awake and the house is totally quiet and my time and thoughts are all my own! I love that online classes afford me the luxury of being able to work when I have time and from the comfort of my own home. Quite often there is an on-line group formed where you can chat with other participants and see pictures of their work which, in turn, sparks further ideas that you can build upon. The price is a huge factor for many of us as well. I know I can’t afford to travel any distance with the extra costs involved. I would far rather save my money and be able to take more classes online! Another great giveaway Mary – thank you. I’ve never attended an online embroidery class and am intrigued by the fact that I could choose the “attendance” hours to suit my schedule and could do it from anywhere that I have internet access. We spend winters in Tucson and summers in Colorado and travel to other places, also, so it is sometimes hard to sign up for regular classes when I don’t know where I’m going to be when! Thank you for organising this give away and for making the embroidery community at large aware of Tanya’s class. I love being able to work on my time, when I can sit and concentrate and be familiar with my surroundings. Tanja’s birds are wonderful and I will definitely sign up for the elephant. Doing the birds first is a good introduction. I always admire your needlework on your projects, they are absolutely perfect. I agree with all your reasons for taking online classes. I have done several and like the time scheduling part the best. I have found that some of the enthusiasm for the class is not there online especially when the class does not have a lot of participation. For me, the most best thing about an online class is saving on travel expenses! I live in Alaska and flights are very pricey – especially during the cold months when I get the most stitching done. Attending an online class saves me money so I can do MORE projects!! What attracts me the most about an on-line class is the flexibility with both time and space. I enjoy on-line courses as I can actually see clearer than when I attend a class and still have more interaction with an instructor than with a correspondence course. I have not participated in an on-line class of any kind. It seems an excellent opportunity to have a course at your fingertips to be viewed at you convenience and reviewed as necessary. I would have to say the best part of online classes is the fact you can do it at any time. I work full time and have no time to attend classes, but online classes allow me to work outside my usual working day. A great opportunity to foster the growth in embroidery these days with so many people have to put it aside until they give up work (and perhaps never go back to it!) This would be a shame as we need to be able to make sure embroidery is alive and well. Online classes are a dream for me! I’m a one legged woman and that’s the only way I can take a class. Blackwork fascinates me and the idea of learning from a world class teacher is almost too good to think about. Now I’m going to keep my fingers crossed, those love birds would have special meaning for me and for my husband, who just finished an 8 month round of chemo. No matter how good or bad life appears at the moment, we’re still two lovebirds. It still brings us joy. I can’t think of a better way to begin learning blackwork! For me, an online class is a gift as I work full-time (7-3 M-F but I often start at 6 and don’t finish until 4), have two children in elementary school and a husband. So the only time I can do a course is when I am not busy with some thing else – early morning (e.g. 4 or 5 am) or late at night (9 pm or later) – so far no local course in anything are offered in those time slots! I would love this class! I like online classes, because as a busy restaurant manager, I have no time! But can do online on my schedule, which really works well for me. I love to embroider and thick black work would help me also in all aspects of shading. Thanks for the chance to win it! I have never attempted blackwork embroidery but have admired my friend’s who has done online classes with Tanja Berlin. As a pensioner I dont have much funding for my leisure activities so am saving up to do an online class sometime in the future. A kit such as you describe would be such a pleasure to learn and enjoy a new technique. What a beautiful project! I love all types of needlework and would love to try my hand at this. Black work can be challenging but I am up to the challenge!!! To be honest, I’ve not ever taken an on line course and feel just a bit nervous about it. Silly, I suppose, as there is so much on offer. In this case, it would hold my hand, so to speak, to enter this world of opportunity. Black work — on my to do list. Thank you Mary for the encouragement of embroidery. I took my first online embroidery class recently and loved it! I could dither around when needed, work all hours when I had the time, and still get to enjoy everybody’s work. And I don’t have to take time off from work or pay to travel. I would love to take this class! Online classes are wonderful. You can be taught by experts in the field while you sit in the comfort of your home. You can revisit the class to review techniques that you need assistance with. There are opportunities to ask questions if necessary. You do not have to pay the expense of traveling! I would love to learn blackwork embroidery. The lovebird are adorable. Thank you for this offer. As a mom that works outside the home full-time, finding time to attend a class is so very, very hard. I enjoy the flexibility online classes have that allow me to still learn new things and express my creativity, even if I don’t get to interact with other classmates face to face. I just found your site and love it. You show many good explanations on why you do something a certain way. I’ve learned a lot already. Do you ever do wool applique. I love everything wool. Sue Spargo comes to mind of an artist who encorparates so many lovely stitches like you have. But she does not offer an online class. I took lot of rughooking classes online and loved it. Fourteen years ago I tried blackwork embroidery and was frustrated that the back didn’t look the same as the front-which I was told it should do. An online class would give me access to individual tuition/help (without the “keeping up with the class” pressure!) With access to individual help, when needed, I could learn the correct technique to iron out my mistakes and finish with a piece of beautiful embroidery worked that I would be happy with -correctly worked with both sides looking the same. I like being able to go back and look again to instructions. don’t always get it the first time. Mary, I’ve only taken one online class and what I really loved about it was the freedom to work at my own pace when I had time to do so. I recently finished a blackwork project piece with an online group, and found it more challenging than I thought it would be, so winning a class with Tanya in blackwork would be perfect. Thanks. I have to admit that I have never taken an online course but the idea is very appealing. I just HAVE to try it and see how I like it. The flexibility of time is a great attraction. This would be a wonderful chance for me to learn the techniques of Black work. Tanja’s work is wonderful. I have seen several patterns that I really want to try and I haven’t been game to start off on my own. Online classes are the best way to learn for me especially as I live in the country. I can take my time, do the work when it fits in with my life, and I don’t have to drag all my supplies to a class with me! YAY! I have taken part in numerous on line classes with some wonderful teachers. The UK online spinners and weaver guild to which I belong run 10 monthly classes a year. It is such a wonderful resource. Apart from the Guild, I have done online classes in embroidery, design, patchwork, dyeing and they have all be incredible classes, so easy to attend so easy to keep notes, a significant skill resource. Online workshops fill a great need for those of us who cannot get to a land based one. It is also a great advantage to have members from all over the world who perhaps can give a different slant on things. Another very interesting learning curve. Online workshops Rock! Thanks Mary for making this avaiable for someone. Blackwork embroidery is so beautiful and it is on my needlework bucket list. I would love to win the contest and learn this embroidery the right way. Unfortunately local needlework stores are no longer plentiful and seminars involve travel and the expenses that go with it. I am retired and have found online classes to be perfect for me. Thank you Mary for offering this great opportunity to one of your stitching fans. Online classes offer the opportunity to dabble in a new area of art or crafting without the total investment involved in taking an in person class. Many of us in rural areas do not live within reach of local classes given by well known instructors, and travel costs make it prohibitive. It is so wonderful in this day and time to have the option of online classes. This opportunity is more special because it offers some wonderful tools to get a start in this beautiful type of artwork. Without a doubt, the flexibility of going at my own pace and taking the time I need to get a feel for the stitching is incredible. Plus, who wouldn’t love taking a class in their pajamas if they could? I really really really wAnt to stitch that elephant —have you been watching that jigsaw puzzle come alive, little by little? It is a tiny piece by tiny piece needle paint, except in blackwork. Tanja says the lovebirds are pre-reqs. I would never consider online, except as a way to get to the elephant . Ah! What attracts me so very much to Tanja & other’s online courses are that they provide me a way to learn & develop an art form that I love but otherwise could not study because I am disabled by a rare disease. Some days are great and some are horrid, making travel nearly impossible. They are an incredible answer for my situation and I’m very grateful to all the people who take time to share their talents online – like the amazing MARY who has so much to share! Best wishes to Tanja’s future, and fortunate, student! Online classes have given me the opportunity to learn from teachers I would only have dreamt of learning from. I have taken a few classes of Triah Burr where I have concentrated on thread painting. I have never done anything but thread painting up to this point and am so appreciative to have studies under such an amazing teacher. I have just discovered balck work, through a member of stitchin fingers and realize the possibilities with this style of embroidery. It would be invaluable to learn again from Tanja Berlin a master in the field also. I am old enough to still be in awe of what the internet has afforded the student of embroidery. I would have never learned of any of it if it were not for this site. Thank so much Mary. I like on-line classes because you can look at the instructions over and over again. You can do the class at a time that works best for you. Being able to email the instructor with specific questions is always helpful. Online classes have given me the opportunity to learn from teachers I would only have dreamt of learning from. I have taken a few classes of Trish Burr where I have concentrated on thread painting. I have never done anything but thread painting up to this point and am so appreciative to have studies under such an amazing teacher. This is a beautiful piece and reminds me of the love birds my sister owned. Living in Australia I dream of being able to participate in classes that I see advertised overseas! I have wanted to learn blackwork for a long time and and online class would allow me to do it at my own pace. I really would like to take a class from Tanja Berlin. Online classes are wonderful. You can view things in the middle of the night or in the middle of the day. It is easy to join the chatter or just delete it if you prefer it quiet when you stitch. It is generally at your own pace-so turtles and speed demons are both happy. Can you tell that I like online classes? I have taken several online classes through Craftsy and I really like this idea. Online classes are flexible and allow one to learn at one’s own rate. Plus the lessons are there to refer back to at any time. As a self employed store owner I do not get time off. I work 6 days a week every week and haven’t had a vacation in over a decade. Going to a seminar is not an option for me. However, having gotten both my children out of the house I finally have some time to stitch again. My Sundays are rapidly becoming sacrosanct so I can have a little me time. Online classes offer me the flexibility to take the class when I have time, as opposed to Wednesday mornings at ten, or Thursday evenings at 6. They also greatly increase the range of classes available. Areas of relatively narrow interest can be offered even if the interest is spread over a wide geographic region. What a wonderful opportunity,I live in Australia and so to attend a class in Canada is a little expensive. To do a class in the comfort of your own home is an amazing experience and to be able to see how to do the embroidery right in front of you again and again would be awesome. Thank you for this great offer. I love the idea of being able to time shift – not to worry about time zones, or the fact that I work slowly. And what a wonderful project! So pretty, and the colour helps to clarify the stitching. I will love being able to learn the shading properly. I really like being able to work at my own speed. I enjoy the journey of stitching and I don’t want to be rushed. Have wanted to dive into blackwork, just have not had that push. An online class would do that for me. I like being able to work at my own pace, putting in as much time as I need to get the work done. In a regular class, I often fall behind, and that can be discouraging. I do so much better when I am not rushed! Online classes are so convenient in our busy lives, and for me, the flexibility they offer are a great addition to face-to-face classes. So often, face-to-face classes are hard to fit in with life’s demands, so the ability to log on when we have time, work at our own pace, and even receive feedback, and tips and pointers is wonderful. I’d love to learn how to shade blackwork so beautifully, especially from such an accomplished needlewoman, who also seems to be an excellent teacher. Perfect. Thanks Mary for letting us know about it, and for the opportunity to maybe even win a place in Tanja’s class. I have never taken a class on line. I am intrigued by the fact that I can sit at my computer and follow along and get direction long distance. I would certainly like to have an opportunity to try it. I have always been intrigued by black work. I have felt it was rather complicated. I really love the two birds. Her Elephant is amazing!!!! I love the idea of taking a black-work class. This is one type of embroidery I haven’t tried yet. I also like who the instructor is and have admired her work for awhile. The aspect I like more about an online course, is that I can work whenever it suits me. I would love to win the online black work course from Tanya Berlin. I hope I will be the lucky one. I first discovered Blackwork when I was a student . I completed a sample and submitted an assignment on this form of Embroidery in 1969 .Now that I am retired I would love to continue to explore this style of Embroidery . As I look after my little grandchildren during the week , I am unable to attend Embroidery classes so an on line class would be perfect . The best thing about online classes is that I can get to do them. Living in a rural area in a remote part of the globe means incredible travel costs to get to a face-to-face class. I worked out recently that it would cost over US$900 in travel and accommodation to attend a class within my own country, you can imagine how much it would cost to travel up to Europe or North America! The wonderful lessons distributed for the classes means that I can revisit the instructions whenever I need to and the flexibility to work at my pace appeals to me as well as the ability to communicate with other participants via the on-line forums. I love the flexibility of an online class. With a husband, toddler, and full-time job there’s not much time (or energy) for my stitching. It would b great to have a project that motivated me to stitch without feeling rushed. I have never taken an online class before… Would love this opportunity!! The black work shading is absolutely beautiful and I would enjoy learning this technique. Definitely the most attractive facet of online workshops or classes is the flexibility–I’m working two jobs right now, seven days a week, so anything I do has to be scheduled in the minute interstices in between those primary obligations. There is just now way I could attend regular classes somewhere, let alone take time off to devote a block of time to it. Thank you so much for hosting the giveaway, Mary! I like the idea of being able to view the class at any time. Maybe two classes in a row, maybe a month between them. I can also stop and do a stitch or two, then go on to the next segment of the class. In this my 70th year I am stepping outside my comfort zone. I attended a weekend class 1,500 km from home, and in 10 days fly to the UK to do a one day class at the Royal School of Needlework. To participate in an online course from overseas would complete my year of being outside my comfort zone, and furthering my knowledge and experience of embroidery. Thanks for the opportunity. What attracts me to this Blackwork class online is that I have always wanted to learn to embroider and a class online is especially perfect for me being handicapped and unemployed! Thanks so much for a chance to win, awesome prize! Your embroidery always inspires me! Well as I’m still working I can’t get to all those weekday classes at my LNS. But the main reason is that I can work at my own pace and also have the impetus to actually keep up and finish a piece!! As a serial UFO producer that is a good thing for me! Hello. I live far away, over the seas, in Romania, so the online class is the only chance of learning from Tanja. I am a beginner and I wonder if I would be capable to obtain beautiful results in embroidery. Thank you, godbye! To join an embroidery course means: airfare, accommodation, etc, etc., plus the actual cost of the course. A bit on the expensive side – so online is THE answer when you live ‘far from the maddening crowd’. Those lovebirds are so cute, I’d love to have a go at them. Blackwork: it’s soothing and almost like meditation. Nothing matters any more except the actual pattern you’re busy with. Well…sitting far off , in a small town in Kerala, it is only online classes I can depend upon to update my skills. So easy to answer – An online embroidery class attracts me most as it is the most comfortable way for human beings to learn and be accompanied by the tutor and techniques for however long it takes – but at a low fixed fee! * Instant access to tutor and techniques at your own pace but for up-front, fixed fee for however long you need! What a fantastic giveaway! How generous you are to open this to everyone too, so often the competitions I see are not open to those of us in the Antipodes. What draws me to this class is what drew me into cross stitch in the very beginning: the methodical nature of the work, and the gorgeous geometric shapes that can be worked to show anything. I also particularly like that she offers specific feedback for your work, so you can really feel like you are having one-on-one time with the teacher. My fingers, toes and eyebrows are crossed for this one, it would make an excellent treat for my upcoming birthday (and no doubt my Mum who will be the likely recipient of the finished work). This is an amazing give-away! I work so slowly that I barely get started in regular face-to-face classes and usually end up completing the bulk of the project at home without assistance, and sometimes, not at all. Apart from the major cost saving of an on-line class, being able to work at my own pace with access to top level tuition is a very big plus. I’ve never done an on-line class so I’m in trepidation as to how they work – but I’m keen to give Tanja’s Love Birds a go, should I be lucky enough to win. The elephant is just incredible. Like many others, I like the flexibility of on-line courses. I have been to workshops and have rarely managed to complete the item on the day. I then have had to work out how to do this at home on my own. Blackwork is a favorite technique of mine – I have wanted to design a piece including my black and white cat. This course would be another step towards that goal. I just love the Love Birds project, thank you for sharing it with us. Online embroidery classes are a huge bonus for me as I live in Perth, Western Australia and we are so far away from what is available to learn overseas. It brings the world so much closer. It’s a huge cost to fly anywhere from Petth to attend workshops and classes overseas. I’m so pleased to see more and more available online for everyone. Online classes eliminate a great deal of travel time….I only have to go to the next room to my computer which is great for me because I live an hour away from everything. I love online classes because you can sit in your kitchen in your pajamas and drink coffee while you learn! I love having the instructor close and being able to answer questions. I really, really want to win this! Mary, I love the online classes because you can start and stop when ever you need to. I have done a little bit of Blackwork and would love to learn more. Also, the price of the giveaway is the best part!! I’ve never done an online class before and would love to try it. There are no embroidery classes in Germany so an online class is the perfect opportunity to learn something new. The flexibility in working my own schedule, at my own pace, would be the biggest attraction for an online class. What a cool giveaway! I like many aspects of an online class but the best is that I can watch when it works for me. Devoting a day or more to a class is really difficult so the fact that I can ‘take’ my class in smaller doses and at my convenience is spot-on. Blackwork is something totally new to me and I’d love to know not only the techniques but the special tips from the instructor, too. I have not taken an online class so am most curious about this. The idea is a good one because everyone can learn and participate on their own time. It allows flexibility in so many ways and allows you to work on things is short periods of time which is important for me at this time. It would be great to ‘win’ this one. Tanja’s kits and instructions are excellent anyway and she is always available via email with critiques and comments but this would be a new aspect of learning more from her. The best part about taking an online embroidery class is getting to work at my own pace! I always have 20 or 30 projects going at once so I rarely sit down and work on just one thing from start to finish. I definitely like the idea of being able to do some here and some there as I get to it. I love black work and on line classes. I work nights and extra long hours so on line classes are convenient because they are flexable . I also cannot always get off the dates from work I would like. I have been trying Blackwork on my own but I could use some professional instruction. I like that you can work at your own pace and there is no peer pressure. And from what I understand (I’ve never taken an on-line class before)if you need to, you can refer back to the instructions. Thank you for this opportunity. Have a joyful day! I love the idea of being able to work on the project and have access to the class offerings any time– day or night, over and over as needed. Thanks for the chance to win this great class. Love being able to access it anytime. What attracts me most about an online class is being able to download the instructions at my convenience – in the middle of the night if I wanted to! I like the idea of working on lessons at any time of day, rather than at a set time. I’m not a morning person, so starting on a lesson later in the day works for me. The aspect of an online embroidery class attracts me the most is the ability and flexibility to go over the class materials as many times as I need to get every bit of the content mastered when I have some time to devote to it. Not to mention the savings from no travel. I love blackwork and have tried it from a bit of info I found in an old book but blackwork can be so much richer and beautiful than what I got from the book. The best thing of online classes for me is the ability to work at my own pace! I like online classes as I am not pressured to work at the tutors pace but can work as and when I can. Also I can revisit any part even years after. Mary,that you can determine your own pace that is the advantage.and I love embroidery to make. I would really like to win.I hope so. Internet learning is the way to bring the whole world together under one roof. Everyone should try it at least once. I always thought online classes were not for me. That was until I recently started a class with Kathy for beginners crazy quilt. I love it I can sit and sew when I want, I can still do all my other work and it just slots into place, I can still be wearing my PJ’s or work clothes. If I have a problem I know it will be answered quickly given the time difference between UK and USA it just works. Thank you for this opportunity Pippa. For me, too, the major advantage of online classes would be the flexibility: the possibility to work at my on rhythm and still have the possibility to ask for advice on tricky parts, once I get to them! It would be great to win this give-away, as I think the love birds are adorable: I particularly like the colored shading. Thanks for this give-away and for your great website in general! I love black work and have been studying the RSN book on this technique. I’ve tried my hand at creating some of my own patterns using grid paper, but I haven’t yet taken up my needle and thread. I would love to have a beginner class to help me get started. I like that I can work alone any time that I like . Other students can be distracting and take away from my learning experience. I love her kits. It would be amazing to have a full class. I have taken several blackwork classes at various seminars. but I would love to learn about shading. The lovebirds blow my mind! All you say, for sure but the most important for me is the flexibility – working at my own pace. My embroidery moments are very irregular, mostly because my health situation. For long I desire to learn Black work embroidery in order to try some of the Escher designs: fishes and birds and so on. As a veteran of 2 needlework classes with Allison Cole, I have learned to appreciate the one-on-one instruction as well as the conversations with the other stitchers. I have been eyeing black work projects online and have been overwhelmed by the complexity. Would love an opportunity to learn another technique! Mostly, it’s the flexibility that attracts me, as I’m doing contract work right now and am never sure what my schedule’s like week-to-week. Also, living in South Africa, shipping from overseas tends to at least double the cost of a kit, if not multiply it, so I’d prefer to substitute materials I can source locally. Thank you for your hard work behind the scenes! I really like online classes mostly because I can do it anytime, totally on my own schedule. What I love about an online class is that I can do it at home and not have to leave my unwell husband – and I can access international classes that would previously have been impossible to attend! I would be delighted to be a part of Tanya’s online course. I am only 71 and still learning new embroidery techniques. I am currently trying to learn blackwork stitching and would certainly benefit from the on-line advice I could receive. Needlework is such a joy! Thank you for your invaluable websites- this one and StitchingFingers”. I love the affordability of the class! Travel, accommodations and meals for an in-person class really ups the cost. And being able to work at my own speed and not missing anything the teacher is saying is wonderful! And this would be a project just for me! I do so many projects for others that I want to see this on my wall! I love the idea of taking an online class! What’s not to love about being able to sit down anytime, day or night, and learn more beautiful techniques? As much as I love sitting with a group of stitchers and learning with and from them, that’s not always possible. Another advantage is I can keep all the information at my fingertips and go back and review the lesson anytime I want. That’s a lot simpler than going through notes I’ve taken in class. Also, having looked at the elephant Tanja designed, I would love to learn the skills I need to make this for my daughter. She loves elephants! I love the flexibility of online classes. I have purchased a couple of them and when I forget something I just go back and watch that part again. So convenient for busy people. I have long been intrigued by Blackwork and have done some in the past. I used to do cross stitch and so am comfortable with counted stitch embroidery. I would relish the opportunity to get some tutoring on how to breakdown designs and approach the stitch selection process. Thanks for the opportunity to do this. Online classes are more convenient. Since I work , online classes are more inviting to me and easier to take. I’ve never done one but would to start with blackwork! I work full time, and it is difficult to get time off. I love seminars and workshops. Although they do offer wonderful learning experiences, they have drawbacks. They require a large commitment of time and money. Online classes allow me to save travel, lodging, and food expenses. It also means that I do not have to leave my family behind; or pay for the added expense to take them with me. Online classes allow me to stitch when it is convenient for both me and my family. Thank you for the opportunity to take this class. I like that it’s flexible so it fits into my schedule. I can re-watch something if I didn’t quite get it the first time. I don’t have to worry about forgetting something, if I forgot something I can stop and go get it. The best thing about online class is the flexibility, comfort and learning from a pro. I always wanted to take a class with Tanya and this would give me the opportunity. I have never taken an online course, but I did attend a seminar with our local embroidery guild. The guest teacher/artist is well known, and the piece was exquisite in design, with a variety of stitches..truth is, that piece and all the threads are in a bag in a closet….waiting to be finished! Too much info crammed in to 3 days in class! I am most intrigued with the opportunity to stitch on my time (evening and late night. ), and have the online instruction as a resource and encouragement to learn black work. The bonus is The Love Birds! I’m so happy and very excited about the online classes, I know you will have many people writing almost the same words, but the difference in my case is that I’m a handicapp unable to travel or go to classes outside my home and this opportunity is amazing and an answer to my prayers. Thank you for your great idea to share your knowledge on line. I will be looking forward to be one of your students. What appeals to me most about online classes is the ability to work on it anytime. I can take it slow, and still feel like I am learning, and getting the most out of the class. Plus, that elephant is gorgeous, and I would love to learn more about that style. Black work is a wonderful technique and patience is a virtue. I started my embroidery journey with this technique. I have done a couple of Tanya Berlin kits and they are well presented with accurate instructions. I love learning how to make everything look three dimensional. Living on a farm in rural Scotland, I have struggled to find any classes or groups that I can join to share my passion for needle crafts, and to learn new techniques. I have discovered the Craftsy video tutorials, and am currently part way through a couture jacket one. What a revelation! people all over the place with a common interest, sharing and learning together. And at my own pace, as I work full time. What’s not to love? I am definitely a convert to online classes. And I have half a beginners blackwork piece completed from a one-day face-to-face class I found nearly 2 years ago, so a bit more direct help would be very useful. I love the flexibility provided by online classes. You need to plan a lot to attend seminars or to take part in work shops. Online classes you can attend from the comfort of your homw when you have time and you escape from all the planning needed to attend direct classes. The aspect that attracts me the most is the opportunity to learn from, and ask questions of, a top class teacher in the field of blackwork embroidery whilst being able to continue with all my commitments in everyday life. I can’t think of anything more perfect! I think on-line classes are the best,as our local exchange rate is so bad that there is no way an ordinary South African housewife could afford any other type of international class. We also live so far away from the rest of you, that we very seldom have international teachers coming our way. Learning from books and magazines are all very well, but to have feedback from Tanja Berlin would be mind blowing. I like online classes because they allow me to work at odd hours of the day and night. That elephant is sooooo awesome! What appeals to me about online classes would be the ability to rewind and re-watch parts I missed, didn’t exactly get, etc. I can stay in my jammies if I want:) Living in the Midwest I can take a class during winter without missing it due to a blizzard. It’s also nice to go at your own pace. My favorite part of an online class is working at my own pace and doing it from home. Plus Tanja Berlin is a great teacher with fantastic designs. It would have to be ..being able to learn in my own home and at my own pace! I have taken some on-line courses in the past. What I like the most is being able to work at my own pace. Especially if it is some totally new to me. It takes me many practice pieces to get the new technique down. I feel less pressure doing an on-line course. The fact that I would be trying something new PLUS learning a new technique! I´ve always been hesitant when it comes to on-line classes but this would give me NO excuses! Thank you, Mary, for the chance. Hi Mary! I have taken one of her courses on line. I live in Alaska and not any in person classes are offered here, so this is the ponly way I can take them without a long and expensive trip. I love black work and have wanted to do one of these when o save up enough. This would be a very special treat. I would use it for the base of a wedding sampler for my friends who are getting married in November! Hi Mary! I love the online classes because I live in Alaska and classes here are nonexistent. I have to travel to take one, so this is a great alternative. Plus I love black work and would use this to make a wedding price for my friends who are getting married in November! I would absolutely LOVE to win this class. I have never taken an embroidery class on line but have taken several quilt classes on line. I like the on-line format, because I am able to do the lessons at my leisure. My husband is retired, and I find that we are traveling much more than usual. I like the ability to do the lessons when I have the time. What a lovely giveaway. Thank you for the opportunity. This would be ideal to get my daughter started on a technique that has intrigued her for a while – but I have never done blackwork. I have taken classes from Tanja and can’t imagine a better teacher to get started with. There are sveral aspect of online classes that I like. The time table is flexible. You have plenty of time to review the directions. And you can always contact the teacher for something you don’t understand. I’ve always wanted to try an online class and have always loved the look of black work but have never tried it. This is a great giveaway. Thanks! I am a blackwork junkie and would love to take this class, Mary! I know a little about shading in blackwork, but not nearly enough. The affordability, and the chance to work with Tanja Berlin are the biggest draws for me to this cyber class. Thanks for the chance! The aspect of an online embroidery class that attracts me the most is that communication and contact with the teacher continues over a period of time. This would allow me access to the teacher whenever I have a question or concern, and is not limited to a certain date or time. I have been intrigued with blackwork, and have researched Tanja’s website quite a bit. Thanks for this opportunity! I haven’t completed an online class. i can see the advantages of doing one; at home in your own time, personal instruction, being able to seek advice and receive feedback from the tutor and sharing with others over the students forum. A class with Tanja Berlin would be perfect as she is such a proficient needleworker and her website offers such good advice I am sure I would learn a lot from this online class. I love that online courses make the world so small! I can take a class from someone so far away without the cost of travel. I am recovering from a broken leg in a skilled care facility (AKA nursing home). I am trying to learn some new skills that I can enjoy while being confined to a wheelchair. I sewed up a storm when I was a girl and a teenager, so I thought that the needle arts would be a good fit. I do enjoy what I have learned so far. Embrodiery really peaks my creativity and yet, has a certain similarity to meditation. Your website is spectacular! I have another surgery coming up. During my recovery I’m hoping to put into practice as many of your tips and projects as possible. I would jump (metaphorically) at the opportunity to have some personal instruction while fitting it in between the therapy and doctor’s appointments. There. That’s my shameless attempt to expliot my situation for gifts. I earderly await your expression of sympathy. As a mother of an infant and a toddler, I find it difficult to embroider even for 30 minutes at a stretch. With such young children, anything I do should be flexible enough to pause and restart at my convenience. And what better way to attend an embroidery class than having it online! The thought of attending an online class, esp one held by Tanja Berlin excites me. I had discovered her website 6 years ago when I bought my first shadow work kit from her. I do hope to attend this class for its flexibility, it’s instructor and the design! The lovebirds are gorgeous!! I have only tried the basics in blackwork and this project looks lovely as a way to learn the shading techniques. Not being in the best of health I tend to avoid workshops etc as I can’t predict how I’ll be for the day. On-line classes seem the ideal solution. Travel is exhausting and expensive. Online classes eliminate this, plus my computer is in my studio, so there is no chance of forgetting some important supply at home! I like an online class as it allows me to learn from my own living room. I love the idea of being able to access help whenever I need it. Blackwork – the supreme of embroidery! I love its simplistic and geometric look. I looks so very difficult; something that would give you a headache, but once you start the segments and get going, it is so calming and so very hard to put down. I would love a Tanya Berlin design and hope that I can be considered for her lovebirds. Thank you Mary for what you do for us stitchers here in cyberworld. The aspect of an online class that attracts me the most is the access to teachers that are otherwise not available. Some teachers no longer travel. Some have limited travel areas. Some simply do not leave their home country. With an online class, locations are irrelevant. The teacher no longer travel, lugging huge suitcases of teaching supplies. I have been lucky to find a few such classes from teachers who are no longer traveling. Also, class sizes tend to be a bit larger online. I’ve been in classes where I wasn’t selected in the lottery due to oversubscribing. With online, classes can easily be double or more the size of the same in person class. I have seen a few number limits due to kit supplies, but those are rare. Online classes are great for convenience. I really like how you take a class from from someone half way around the world but not have the travel or lodging costs. Online classes allow me to take a class without worrying about rental cars, hotel rooms, overpriced meals and boarding the dogs. I don’t have to deal with the the numbing effects of folding chairs or overloaded extension cords. There’s no jostling with other students to see what the teacher is doing or missing a step because I’m working at a different pace. The best part of an online class is being at HOME! As I am living in The Netherlands all the nice courses in the rest of the world are not for me. I cannot take long holidays just for my embroidery hobby. Online classes are the solution to this problem. They come to my home and I can follow them whenever I want. And these little lovebirds are so sweet! I like on-line classes because it gives access to everyone. You can do an on-line needlework class at your own pace any time of day or night (I’m a night owl). What a great prize. I don’t do very much blackwork & have never had any formal instruction in it. It would be wonderful to learn proper techniques. I was surprise by the photos of the black work, its a beautiful work, the final is wow amazing, i love to take the class. I love the fact that you get the teachers opinion and helpful hints so quickly and post your progress so others can see how you interpreted the teacher’s advice into your work. Then the comments that follow can be quite surprising and enlightening! I like the idea of being able to go over and over a part I don’t understand, and no one will be irritated or laugh at me !! After all, we don’t all learn the same way or at the same pace. I love the that they give you access to great teachers from all over, just about anywhere. They are affordable and they combine the advantage of a great teacher and a great book. I buy books but . without a project, or feedback I never seem to master techniques. This is particularly well timed as I love the look of blackwork, and I just got inspired by a gift of the RSN Embroidery Techniques book. I like that I can watch/view tutorials and work on something whenever is convenient for me. It’s also great to be able to watch the videos over and over when needed. I also see a huge difference in the amount of materials provided in online classes vs. the handouts received in live workshops. In a recent live workshop I took recently on bag making, the teacher only provided the pattern pieces and demonstrated all the steps. Without the little videos I took of each step (with the teacher’s permission, of course), I would never remember any of it! I have been embroidering since I was child. (Forty +years) I have never had any “formal” classes. I would like to learn more techniques. The flexibility of the class is a plus. I love online classes as I deal with quite a number of health issues and I never know when I am going to have my good days. I don’t sign up for local classes for just that reason, I could waste a lot of money and not learn what I wanted to, by missing classes just because I was completely unable to go. Now on to this class…I am enamored with the Holbein Stitch and Blackwork in general. BUT the fact that this embroidery is Lovebirds thrills me to no end. When I was healthier I raised Lovebirds. I would take the babies from their parents, Peaches & Cream, when they were about 5 days old and hand raise them so they would be tame and could go into a home singly. I had to stop when it became to much for me health wise. Those tiny birds need to be fed every two hours around the clock. My two had big clutches, so it might take me an hour to feed all of them, stumble back to bed and get up in another hour to do it all over again. I loved it! We didn’t let our two overbreed but we sure had fun as the little ones grew and developed their own personalities! It is true that Lovebirds have to have a mate but that mate does not need to be another Lovebird. If you spend enough time with them they can “mate” with you. I am down to one Lovebird now, Ella, though I have birds of other species. I know I will always have a Lovebird in my “flock”. In fact my mail name is lovebirdmom. To make this piece would mean so much to me. Online classes provide a flexibility that can’t be had at classes onsite. I especially like that I can ask questions and not slow anyone else down because I’m not taking the instructor’s time away from them. Finally, who can beat having your own comfie chair and fridge in the next room! Online classes can be done in your own time and at your own pace. My friend suffers frequent migraine attacks. She never knows when one will strike and is reluctant to make commitments. She wanted to attend BATB to take a class with Tanja Berlin but with considerable travel and accommodation expenses and the possibility of being unwell, decided against attending the event. If I win, I would like to give this class to her. Thank you Mary. One of the things that draws me to online classes is the access to quality teachers that distance would prohibit. But really there are many things that make them a great option! I first encountered blackwork on a student trip to England many years ago; I saw an instruction book on “Modern Blackwork” and promptly sacrificed from my student-level budget to buy it. It was “modern” because the black designs were embroidered on colored fabric! Since then, I have done some blackwork, but all self-taught and nowhere near the sophistication of Tanja Berlin’s work. I have taken one online embroidery class in the past, and love being able to work at my own speed, and, if I happened to have a week full of other responsibilities, knowing that I could finish without having to catch up with everyone else first. I am not often able to travel or get out of the house even, so online classes are usually the only option for me. I love Tanja’s work and have always hoped to do some her blackwork one day. I am excited to have the chance to challenge myself by learning a new technique, in a way that allows flexibility to not worry about my long awaited trip to Europe for anniversary year 30; and almost 3 years cancer free for my husband. After multiple back surgeries I work only “as needed” and I think I need to find myself a new area in which to be challenged, with the support to “get it done! !” (the bane of many a stitcher I understand). My husband says my stash would embroider the NJ turnpike! What’s not to love about an online class?? You can dress however you want! You can work at your own pace. You can sit in your comfortable chair with your favorite light! I’d love to be able to enhance my blackworking skills with this class! Thanks for the opportunity! I love being able to work at my own pace which is what I am afforded with an on-line class. This can be slower, so I can practice a difficult technique or faster if a part of it is a review. It is also nice to go to my comfy chair in the living room in my pajamas to take a class. G’day there Mary, gone to ground lately, but with one eye open, so dug out for this one. I’m a slow stitcher and shy about being out there with my embroidery. I’ve attended live classes and am left with UFOs because I seize up although always learn. Besides being able to stitch and learn when it suits me, I like the relative anonymity of being able to ask, discuss, show and look without feeling too embarrassed. I’ve learnt many good pointers in classes by taking notice of the teacher instructing a class mate (no wonder I don’t get my own done!). Both students and teachers can get understandably edgy with you looking on. If someone was watching me I’d be so relaxed and open minded about it…NOT! I’d probably start acting silly from embarrassment and make a goat of myself! Online you can look and learn to your hearts content. I love to see other students work, the little tweaks of ingenuity, the amazing faster stitchers, the ability of class mates to correct work and the difference a correction makes. The individual help, critiquing and encouragement for myself from an online class is invaluable, as is the opportunity to even be able attend these classes. The best tutors don’t define mistakes as something wrong, they simply show, and encourage you, in an alternative or more appropriate way for a happier result. Thank you Tanja and Mary for offering this competition. I really like the idea of Online Classes as it gives you the opportunity of getting one on one time with the instructor. Also, I would love to learn the proper techniques to do Blackwork at my leisure (I tend to stitch slowly). I have visited Tanja Berlin’s web site and she even offers the student who orders a kit by mail to email her with questions, pictures, etc. if they have any concerns or comments! How can you beat that? By enrolling in an Online Class! You would get all that and more! For me it is a combination of two aspects-structure and flexibility (nothing like talking out of both sides of your mouth!). I need structure to learn–an outline, someone to guide me–a plan. Classes fill that need for me; however, I can’t just drop everything for multiple days to attend. Online classes give me the flexibility to work in the structure I need, when I can. The lovebirds pattern is just adorable. I’ve done very little blackwork and have never taken an online embroidery class. I’d love the chance to expand my knowledge through a new experience. The convenience! What could be better than staying at home and having the class come to you? Nothing! Other online classes I have taken have had a lot of student-teacher communication and they have been great fun. What aspect of an online embroidery class attracts me the most? The fact that I can assist to the class from my home at the convenient time for me. I have been really into blackwork lately so I would love to win this class. For me it is perfect that with an online class there are no fixed times as I have a very irregular work schedule. I have been using a computer for some time but I have never tried an on-line class. I have done other Tanja pieces and enjoyed them and her teaching style. Since I have only done a few (very somple) blackwork patterns this eems like a good one to start with. I like the possibility to follow a class even if you don’t live on the same continent! Online classes are great for those that need flexibility when taking a class…It is nice to be able to sit down with a coffee and start the class.. The flexibility really hits me as wonderful right now. With school about to begin and fall cleaning upon me, an online class like this would be a good little break I could have from time to time and learn a beautiful skill too. It is the beauty of the blackwork embroidery. How can one not succumb to it its charms and want to know it better? I would enjoy trying a new “way” of learning. I am a beginning embroidery student and this looks like a great project. I would love to be able to learn enough to embroidery the elephant picture afterwards! I like that I can learn at my own pace and in my home where I can stay in my PJ’s if desired, and sip tea while I work. I keep an odd schedule so attending an online class fits perfectly into my schedule of having free time from midnight until about 3 am for crafting. Plus, lovebirds have a key place in my heart as my mom had a lovely set while I was growing up. Tanja’s work is amazing! A couple of years ago I stitched her owl needlepainting . She was very very supportive! Her instructions are the best! Attending one of Tanja’s classes in person would be wonderful but my time is limited so an online class would be perfect. Love this class! With online classes I finally feel like I can attend and learn something along with others, since my physical disability makes it hard to commit to anything at any time of day. With an online class I get to associate with others who enjoy it, learn something new and wonderful (these birds are absolutely priceless!) and share it with like-minded people-even if it’s from a doctor’s office. It helps make things in a difficult life (with a new kindergartener in the mix too!) a little more normal. That is a gift that all should get to experience! Whoever wins is very, very lucky! I’d love to learn blackwork embroidery! It has always interested me with all the intricate patterns but, I’ve never been brave enough to try to learn on my own. I would love to win this class! Thanks so much for the invitation! Awesome. I would love to learn a new embroidery technique. Blackwork is so striking and makes the ordinary extraordinary. I have often wondered about Tanya berlins classes. The online aspect of this class is so appealing to me at the moment because I have taken on a bit too big of a bite with my local EGA chapters to teach projects this winter (including some blackwork!) Doing this on-line gives me the freedom to improve my own skills at the times best for me while still keeping my promises to my fellow stitchers. I want to meet those deadlines! Thanks for offering the class! I still work full time and put in long hours. I am only able work on my embroidery in the evenings when I get home. An online class would be possible for me. And something I could really look forward to when I got home. One of the main advantage of an online class is “it eliminate the distance between trainer and learners. While another benefit is if this vedio saved or download, anybody at any time can watch and learn from. Having already completed a task from Tania I would love to win this one. I have tried blackwork but not won it over. I need tuition, and she is good, I mean really really good. As we are living in a caravan and traveling around New Zealand an o linecourse would be the ideal thing for me. I do miss going to my embroidery guild at home but have found that the other guilds around the country welcome me as a guest and it is so good to keep in touch with other embroiderers. I have only tried blackwork once a d would really like some expert tuition. Thanks for the opportunity to win this course. I live in a country, where there are no serious embroidery classes. So very often I have to “invent the bicycle” once more. Online classes are very useful for me. I guess, the most interesting classes for me would be silk shading and goldwork. But all the others would be great source for learning too. Since I work out side home it is great to be able to have the flexibility to set my own time to work on the class and project. Sounds like a great idea. I enjoy online embroidery classes because I can follow the class while it is in process but save the material and actually do the project at my own pace and when it fits into my schedule. I think the best part of an online class is that you have access to a professional instructor and can take the class at your own pace- I have rheumatoid arthritis in my hands and I am a slow, but faithful stitcher, so going at my own pace is great and less stressful! Thanks for the opportunity! You ask ‘what appeals about on line classes’. I have only taken one (from Tanja) and here are my observations. 1. You can do it all in your pyjamas and no one will know. 2. All of you favourite tools,reference books, lights. and chairs and tables, are within reach at all times. 3. On line courses give lots of time. 4. No need to venture out in a thunderstorm or a blizzard. Oh,yes. On line courses are just my cup of tea! Every morning I look for your e-mail – it always entertains and educates. Your e-mail comes before the Sudoku puzzle in this house. The embroidery is absolutely exquisite, Tanya is certainly a very talented lady. Our Guild group is doing a Blackwork project next year, but I can’t wait and and would realy love to be included in this class, it would make my day if I was lucky enough to be chosen. I like online classes mainly because it fits my budget and to learn at my own pace always helps me to understand a technique better. Thanks a lot Mary and Tanja for this wonderful give-away. As someone who has sighed over information about stitching weekends and seminars, I find the total flexibility of online classes very attractive. I also like the prospect of having personal feedback on my work from an expert. I have promised myself an online class or two this fall and winter, inspired in part by Tanja Berlin’s newsletters.